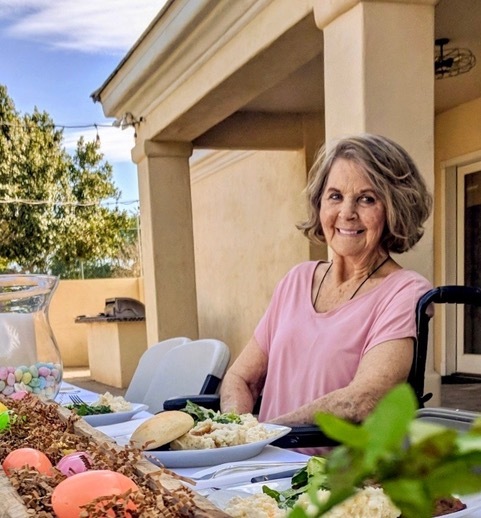 Janae Bledsoe Towle, 80, of Mesa, Arizona passed away June 29, 2018, surrounded by her adoring family. She was born May 3, 1938 in Idaho Falls, Idaho to Frank and Irma Obrey. She made an early appearance and had to be delivered on the sidewalk by her father while on the way to the midwife. Janae moved to San Francisco in her early years with her brother, mother and step father (Guy Bledsoe) and was raised in various cities in the Bay Area. She graduated from Las Lomas High School in Walnut Creek, California in 1956. She attended Diablo Valley College, and Brigham Young University. Janae met and married Michael George Towle in 1961 and had 4 devoted children, Kevin (Robin) of Alpine, UT; Sheila; Charlotte Rush (Jeff); and Alison Turley (Guy) all of Mesa, AZ and 14 grandchildren, who all love their Grandma, Granny and G-Ma very much. She was a member of the Church of Jesus Christ of Latter Day Saints where she raised her children in the gospel and served faithfully in many callings. She also volunteered in the community, most notably for the John Muir Hospital Ahwahnee Guild, as the auxiliary President and committee member. Janae enjoyed working for Nordstrom for many years and was a corporate top seller, earning many awards. She was an avid antiques collector and dealer, decorating diva, cat lover, garage sale queen and was a person who had a generous heart, creative mind and a wonderful sense of humor. She never complained, and you would never have known that for many years she suffered from Parkinsonian Multiple Systems Atrophy. She leaves a large void in the lives of everyone who knew and loved her. She is survived by all of her children and grandchildren, her siblings, Jerry Obrey, Anita Bledsoe Dahl and Dennis Bledsoe. Janae is proceeded in death by her parents Irma and Guy Bledsoe, Frank Obrey and her former husband and friend Michael Towle.